Now it's so easy to make fermented foods part of your diet! We live in a fermentation nation. Fermented foods like yogurt, sauerkraut, and kombucha are popular blog and diet staples, and rightfully so! They are loaded with nourishing probiotics, and they're downright delicious. While most people know they should be incorporating fermented foods into their diet, they're not sure how to consume them on a daily basis. Fermented Foods at Every Meal changes all that. Author Hayley Ryczek teaches the ins and outs of weaving fermented foods into breakfast, lunch, and dinner. This book introduces readers to: Yogurt, Sauerkraut, Kombucha, Kefir, Creme Fraiche, Dried Fruit Chutney, Fermented Ketchup, Fermented Carrots, Sweet Pickled Relish, Sweet and Spicy Tomato Salsa. 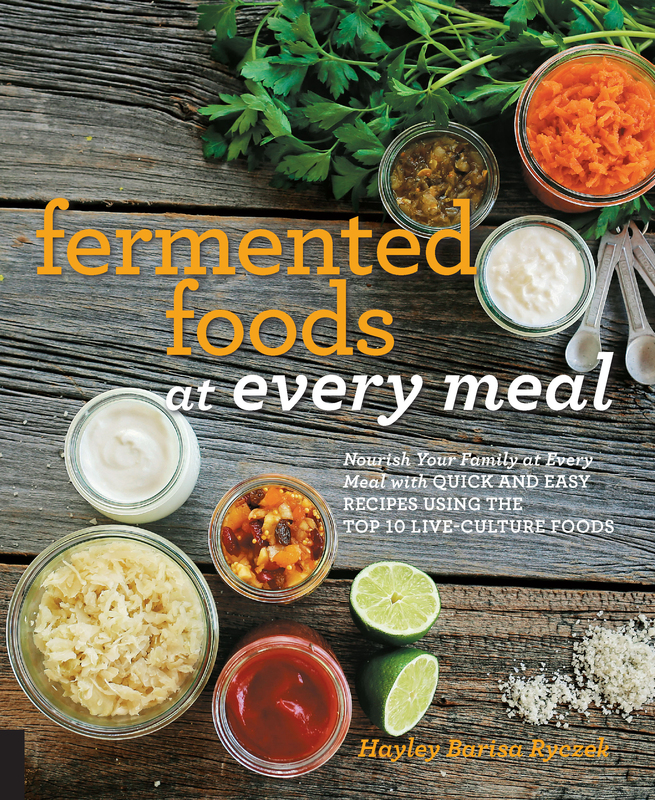 Each chapter in Fermented Foods at Every Meal delves into one of these ten fermented foods and teaches readers how to make it at home. The book then guides readers through simple ways to use each live-culture powerhouse food, starting with simple recipes, such as Sweet Creme Grilled Peaches, and moving into more inventive eats that cross over with ferments from other chapters. In Fermented Foods at Every Meal, emphasis is put on retaining the probiotic and enzymatic qualities of these foods by not overheating them. After all, anyone can blend kefir into muffin batter and call it a kefir recipe, but the oven kills the properties of kefir that help you digest the meal you're eating, which was the whole point of consuming fermented food in the first place! This book's emphasis on informed, healthful eating, plus the range of recipes it offers, set Fermented Foods at Every Meal apart from any other book in its genre. Revolutionize your daily diet with these delicious probiotic powerhouse recipes! Hayley Barisa Ryczek is the voice behind the healthy cooking and natural lifestyle blog, Health Starts in the Kitchen. After a diagnosis of Celiac Disease in 2010 Hayley eliminated grains, gluten and legumes from her diet and set up a blog to help others enjoy a traditional, real-foods diet. She became a Holistic Health coach certified by the Institute of Integrative Nutrition in 2012. Hayley's recipes have been featured in Readers Digest, Ziplist, Food Gawker, Chris Kresser and Dr David Perlmutter's websites. Additionally she is a contributor at Kitchen Daily and Wellness Media Magazine.